Korissa Williams scored a game-high 21 points and pulled down 14 rebounds as the No.1-ranked Windsor Lancers defeated third-seeded McGill 60-47 to capture their fifth consecutive Bronze Baby trophy as CIS champions in women's basketball, Sunday, at the PEPS Centre on the campus of Université Laval. McGill's silver-medal result was the best-ever finish at the CIS tourney for the Martlets. 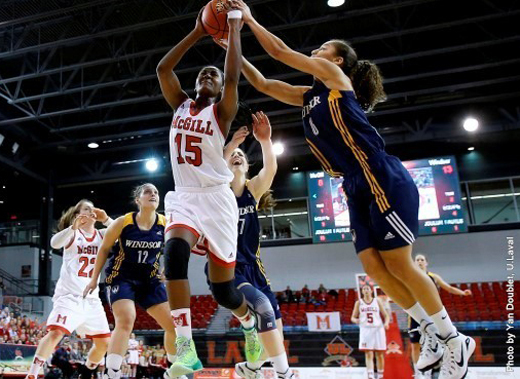 Mariam Sylla was named as McGill’s player of the game in the CIS gold medal contest against Windsor. Korissa Williams scored a game-high 21 points and pulled down 14 rebounds as the No.1-ranked Windsor Lancers defeated third-seeded McGill 60-47 to capture their fifth consecutive Bronze Baby trophy as CIS champions in women’s basketball, Sunday, at the PEPS Centre on the campus of Université Laval. McGill’s silver-medal result was the best-ever finish at the CIS tourney for the Martlets, whose previous best was a bronze medal in 1996, also in Quebec City. The Martlets, who captured the RSEQ league crown for the fourth straight season, finished with a 26-5 record overall, including a 15-1 first-place standing atop the Quebec conference. McGill’s player of the game was Mariam Sylla, who registered her 13th “double-double” of the season, with 10 points and 11 rebounds. Teammate Alex Kiss-Rusk also added 10 points to go along with eight boards, while Gabriela Hebert had nine and 10, respectively. Hebert was the only member of the Martlets named to the all-tournament team. McGill, which boasted the top-ranked defence in the country – allowing 50.5 points-per game – did a good job of keeping the nation’s top offence in check, holding the Lancers well below their 80.5 points-per game average. The struggle for the Martlets instead, came on the offensive side of the ball where they shot an ice cold 19-for-72 (26.4 per cent) from the field and 3-for-13 (23.1 per cent) from long range, easily their most lethargic performance of the season. Windsor shot 37 per cent from the floor and an impressive 44.4 from three-point land. The Lancers also did a masterful job getting to the foul-line. They went 16-for-23 from the stripe while McGill only had six attempts converting all of them. Williams, who was named as the tournament’s most valuable player, was especially crafty at drawing fouls as she founded herself at the line 13 times, sinking nine of them. Windsor had two other players reach double digit figures in scoring as Emily Prevost and Cheyanne Roger had 12 and 10, respectively. Roger was named player of the game for the Lancers as the majority of her points came at key moments down the stretch. The Windsor big also pulled down eight rebounds and had one steal. The first quarter was marked early-on by constant pressure from Windsor that wore McGill down and by the end of the period, the Ontario champions were up 21-10. McGill gained momentum in the second frame, after a pair of three-pointers from Dianna Ros and Carolann Cloutier that brought the Lancers lead back down to seven. However, Windsor responded with a three of their own from Caitlyn Longmuir and the teams went into the intermission break with Windsor ahead 34-26. The second half started much the same as the second quarter, with the Martlets scoring early to close the gap to 34-32. But the Lancers once again responded, going on an 8-0 run. Williams continued to set the pace for both teams, accumulating 21 points after 30 minutes. Windsor took a 45-38 lead into the final stanza. The Martlets narrowed the gap to five points, but as hard as McGill tried, the Lancers never cracked under the pressure en route to the 13-point victory. Windsor now equals a record set by Laurentian, who also won five consecutive national titles between 1975 and 1979. Williams and fellow fifth-year player Jocelyn LaRocque have now raised the Bronze Baby trophy in each of their past five seasons, a feat never before accomplished. MARTLET MURMURS: Graduating seniors who have worn the McGill jersey for the last time include Carolann Cloutier, an educational psychology major from St. Mathieu de Beloeil, Que., plus Tiye Traore a science senior in kinesiology who hails from Sudbury, Ont., and Marie-Pier Bastrash, a medical student from Trois-Rivieres.